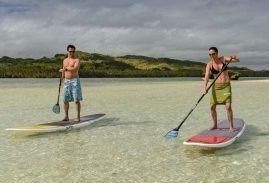 If you’re looking for a destination where you can escape for unadulterated bliss with your other half, the idyllic shores of Fiji are waiting for you. 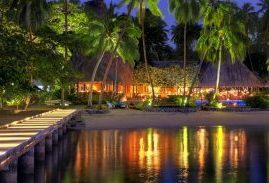 The Jean-Michel Cousteau resort on Vanua Levu is the perfect destination for a luxury couples holiday in Fiji, where you can escape the everyday and share the bliss of a luxury resort. 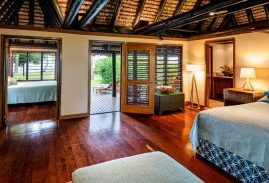 At the heart of every island getaway is a beautifully appointed resort, a base from which you can wander the pristine white beaches or unwind with a soothing couple’s massage. 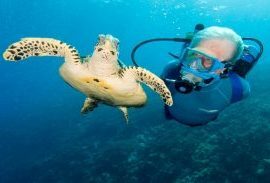 Here is what Jean-Michel Cousteau Resort has to offer. 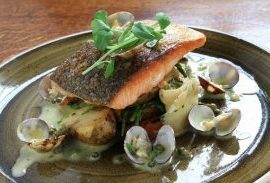 a specially prepared local-style meals featuring all organic, resort locally-grown produce and seafood. and build relationships with Fiji Families, through daily festivities, games, fun…all in a casual, friendly atmosphere. 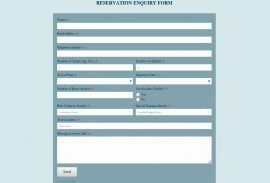 Why choose us for your couple’s retreat? 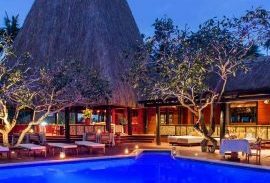 At Jean-Michel Cousteau Resort, you’ll find everything you could need to make your couple’s holiday complete. We think of everything, so you don’t have to. From beautifully appointed Bures and villa, to luxury spa facilities, you can set the pace for your time here to anything from relaxation to adventure. 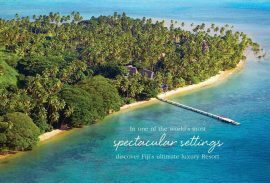 Set against the backdrop of the stunning Savusavu Bay, the resort is the ultimate in Fijian authentic luxury. Surrounded by the lush greenery of the island and the crystalline waters off the shore, there is no better place for you and your loved one to leave the world behind and escape. 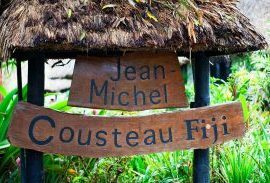 Here at Jean-Michel Cousteau Resort, you can spend your days together to the sound of the whispering breeze and the ocean waves, making use of our world-class spa facilities, snorkeling & diving in pristine waters, playing a casual game of tennis or heading out for a sail before returning for a sumptuous dinner under the stars. 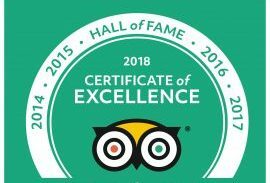 We also offer our guests the chance to engage with local culture and nature with authentic experiences in addition to our recreational activities. Indulge in our heavenly spa treatments, from wraps to relaxing massages. 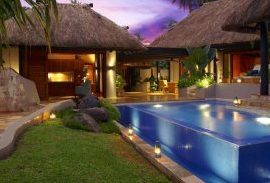 Our world-class spa facilities are unique in that our treatments are based on traditional Fijian therapies handed down through generations. The ingredients we use in our spa products are all natural and locally sourced, from papaya, pineapple and local nuts; to cacao and virgin coconut oil hand-pressed from a local village. 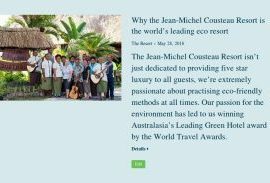 At Jean-Michel Cousteau, we are dedicated to preserving the beautiful environment around us as well as providing the opportunity for our guests to discover our ecological activities. 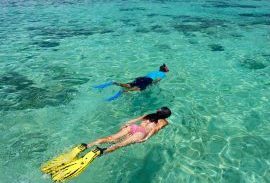 Head out on guided snorkeling trips and glass-bottom boat excursions accompanied by our resident marine biologist, Johnny Singh, or explore the nearby mangroves and rain forests on a nature hike. 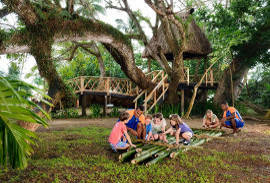 We also have an edible landscape tour, clam farm excursions and a traditional Fijian medicine walk. 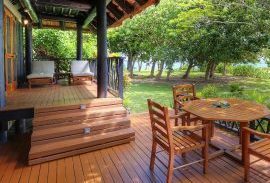 If you fancy a more relaxed pace, you and your other half can enjoy our daily early morning yoga classes just steps away from the sands of Savusavu Bay, or a romantic night of stargazing. 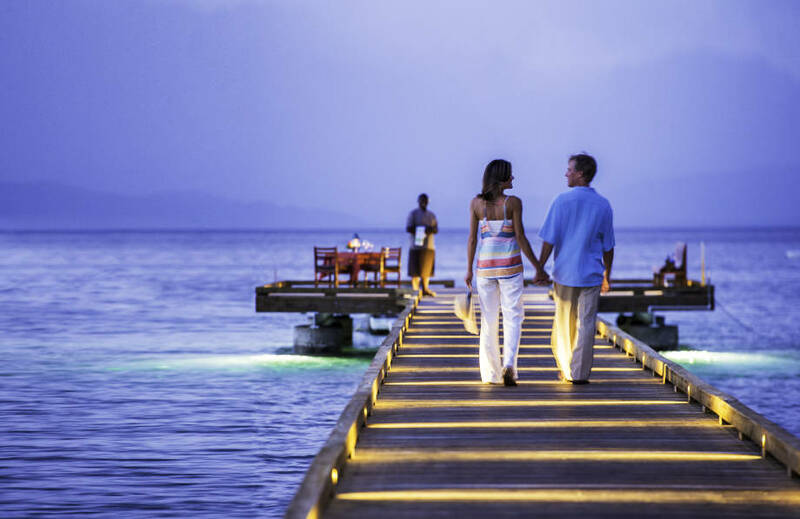 Once you’re acclimatised to island time, steal your loved one away for a visit to your very own private island. Just a short boat ride away, Naviavia is a secluded retreat where you can enjoy pristine beaches, amazing snorkeling and vibrant bird life viewing on an island all to yourselves. 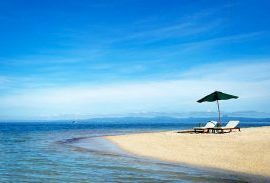 We supply you with a sumptuous picnic for breakfast or lunch, as well as beach necessities, leaving you and your partner to enjoy a romantic island escape. 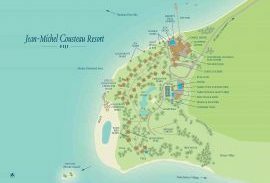 The Jean-Michel Cousteau Resort is the perfect setting for a luxury island wedding. Say “I do” against the backdrop of a beautiful traditional Fijian ceremony on a private beach. 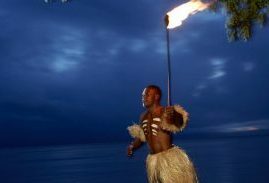 The bride will be carried to the awaiting groom by Fijian warriors to the gentle sound of conch shells and Lali drums – all arranged by our experienced in-house wedding planner. 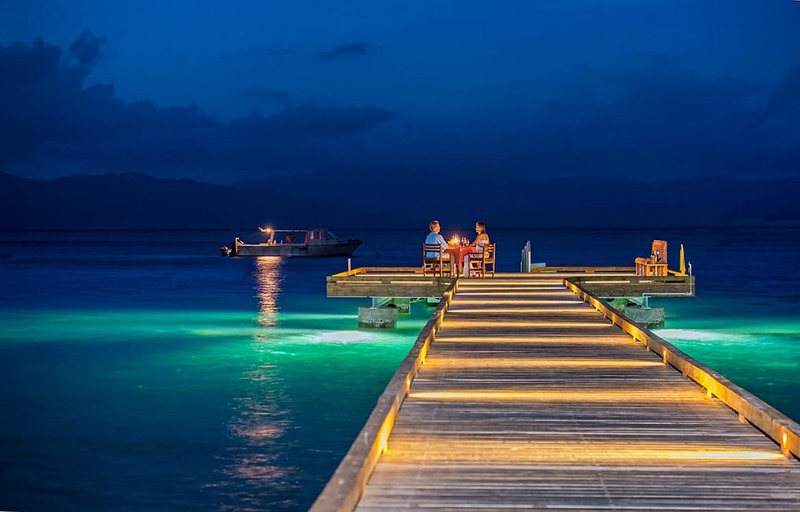 After a sunset ceremony, treat yourself to a gourmet meal under the stars, the perfect transition to your romantic honeymoon. 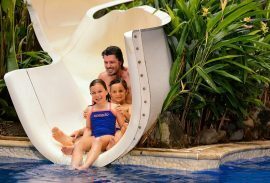 Whether you’re newly married, or celebrating a wedding anniversary, there’s no place like Fiji to spend quality time together. 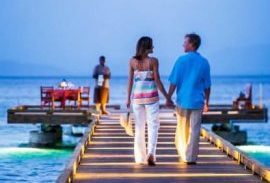 With pleasant temperatures year-round, idyllic beaches and luxury amenities on hand, our resort is tailor-made for lovers. 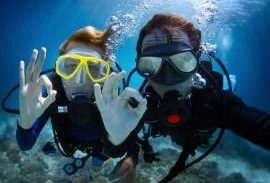 Make your romantic holiday one to remember with our range of activities. 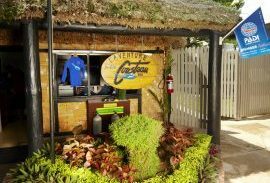 Head out to the water to enjoy catamaran sailing, paddle boarding and kayaking, before relaxing on the beach with a picnic or taking a snooze in our hammocks. 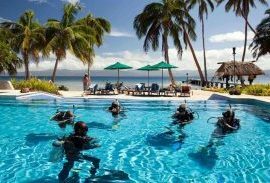 The resort is located in an area famous for its soft coral and is teeming with fish, meaning that you can enjoy brilliant snorkelling and scuba diving. 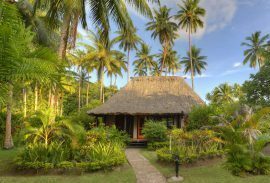 Venture out to experience local Fijian culture with visits to the Savusavu farmers market, Nukubulavu village and a local school. 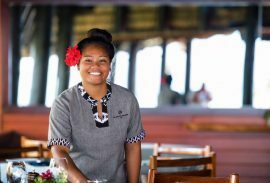 Here at the resort, you’ll also have the chance to experience Fijian storytelling, as well as palm leaf basket making, not to mention the excitement of a kava ceremony, Fijian lovo banquet and the melodious voices of our Fijian band. 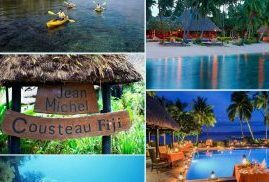 Jean-Michel Cousteau Resort on Vanua Levu is not only a wonderful location on Savusavu Bay, we also pride ourselves on being an eco-friendly resort. This means you can fully enjoy your vacation while supporting our efforts to preserve this pristine environment. As part of our conservation heritage, we also have the opportunity for our guests to immerse themselves in the incredible oceanscape, thanks to our resident marine biologist, Johnny Singh. 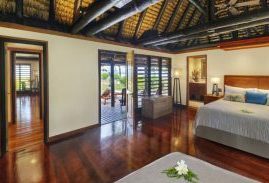 At Jean-Michel Cousteau Resort, you’ll find everything you could need to make your couple’s holiday complete. We think of everything, so you don’t have to. From beautifully appointed bures and villa, to luxury spa facilities, you can set the pace for your time here to anything from relaxation to adventure. 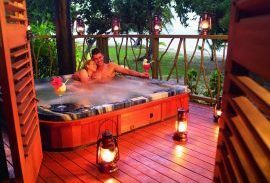 Escape on a romantic couples holiday.? 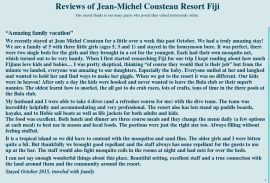 Very few hotels or resorts in the world have a staff team that is even close to the calibre of the Jean-Michel Cousteau Resort team. Guests will form a bond that goes deeper than expected. When a team of locals genuinely care about you, It’s obvious. Service begins and ends with care. 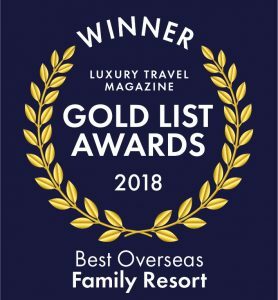 Read more about awards and accolades we have received for our personal attention to detail and dedicated service. 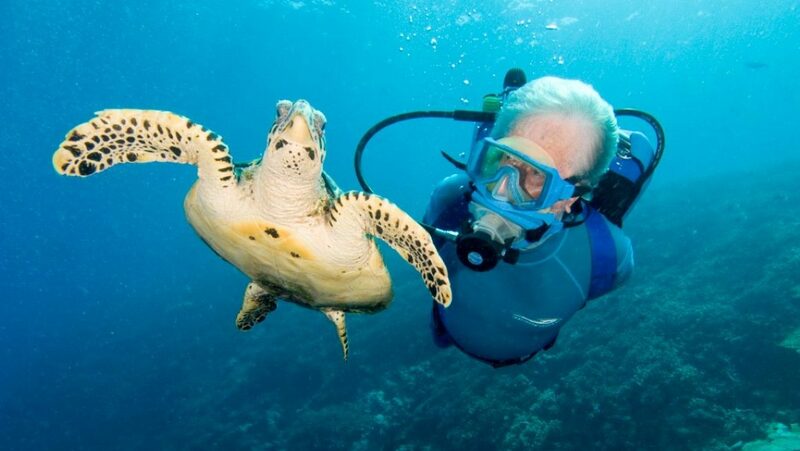 Legendary Jacques Cousteau said: “We protect what we love”. 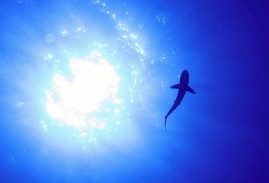 He referred to the world’s oceans. Jean-Michel himself, an inspiring and tireless environmental hero and educator, was inspired to teach the world’s future decision makers to enact a generational change. 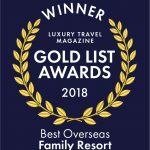 This makes up part of the resort’s ethos. 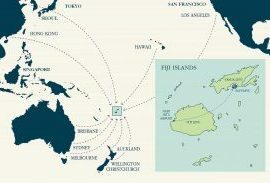 In the remote Northern Islands, Fijian culture remains as testimony to a proud three-thousand-year legacy of lineage. Fragile by nature, cultural protection is integral. Guests enjoy integrated influences. 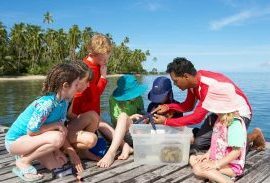 Read more about our Fiji Cultural Immersion program. 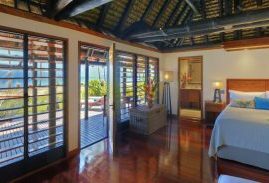 Experience the serenity of restorative yoga in a pristine setting within sight and sound of the tranquil waters of Savusavu Bay. Immerse yourself in a soothing and restorative spa treatment designed to induce harmony and balance the senses. Relax to the gentle sounds of ripples at the water’s edge only a few steps away. 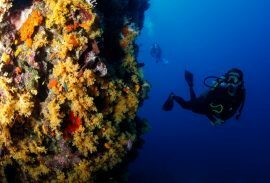 The acclaimed diving Mecca, announced in the top ten of global sites is submerged below the waters of Namena Marine Reserve, just forty minutes by speed boat. A dozen local sites are but ten minutes away. 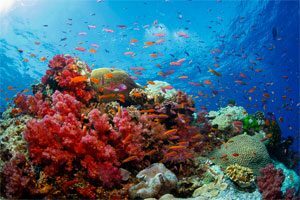 This is the “Soft Coral Capital” of the world. 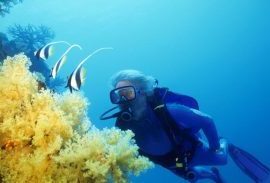 Read more about our Fiji Diving program. 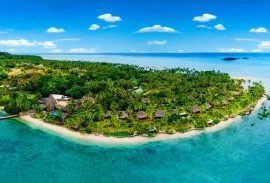 Idyllic and typically South Pacific at its most stunning, this deserted island is catered exclusively to guests in style. Daily changing activities based on Cultural and Environmental themes offer five off-site tours that are inclusive. 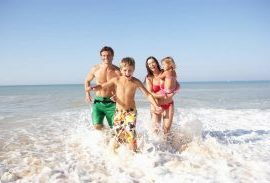 Integrated for four age groups and adjoining seamlessly, these offerings form a relaxed but actively engaging agenda. 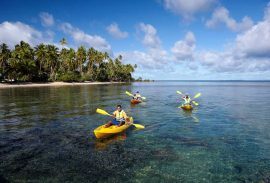 Not being confined to small space provides many options to explore the interesting and diverse town of Savusavu. 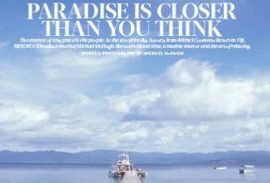 Markets, half a dozen Indian restaurants and handicraft stores are some of the sights making up the South Pacific scene.